Bike East Bay, in partnership with the California Bicycle Coalition, helped pass the Bicycle Traffic School bill (AB 902) in 2015. This allows people ticketed for a vehicle code violation while bicycling in California to attend a class and have the fine reduced or removed. Below you can find answers to frequently asked questions for ticketed individuals, as well as for bike advocates/educators or police departments interested in setting up a program in their community. What is Bicycle Traffic School? Is Bicycle Traffic School available everywhere in California? More history on Bike East Bay’s effort to have this statewide Bike Traffic School law enacted. In which cities/counties is Bicycle Traffic School being offered? Where and when are classes available? How quickly do I need to attend a class after receiving my ticket? Is there a cost to attend a Bicycle Traffic School class? How do I prove to the police that I attended a class? Do I have to attend a Bicycle Traffic School class in the same city where I was ticketed? Am I required to attend a Bicycle Traffic School class if I am ticketed while bicycling? How much will my ticket fine be if I don’t attend a Bicycle Traffic School class? Will Bicycle Traffic School remove points from my drivers license? What should I do if I believe that my ticket is invalid? Bicycle Traffic School is not being offered by the police department that ticketed me. How can I help get a Bicycle Traffic School program set up? How will a Bicycle Traffic School program benefit my community? Should we charge a fee to participants at our Bicycle Traffic School classes? What are the recommended funding sources for classes? How frequently should classes be provided? How does Bike East Bay operate its Bicycle Traffic School classes? Is there an official teaching certification or curriculum standard for Bicycle Traffic School classes? 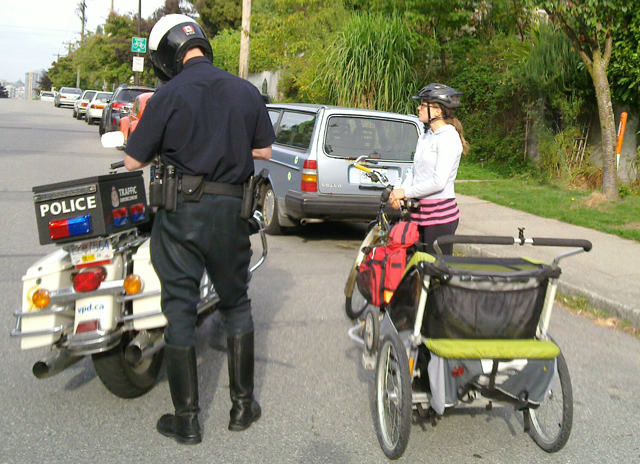 Will Bicycle Traffic School programs encourage police to ticket more people on bikes? How can I encourage my local police department to establish a Bicycle Traffic School program in my city? Bicycle Traffic School is a program offered in partnership with local police or county courts, allowing people ticketed for a vehicle code violation while bicycling in California to attend a class and have the fine associated with their ticket reduced or removed. No. This is an opt-in program which local police or county courts may choose to implement, as allowed by Assembly Bill 902 which became law in 2016, amending California Vehicle Code section 42005.3. Bike East Bay helped to initiate this vehicle code change to make Bicycle Traffic School programs specifically legal statewide. Click here for a list of California cities where Bicycle Traffic School programs are being offered. Click here for a full list of existing Bicycle Traffic School programs in the East Bay (Contra Costa and Alameda Counties only). Class dates and times are listed at BikeEastBay.org/UC101. Most police departments will hold a ticket for a period of time (often 30 or 60 days) before sending it off to the county court for processing. Details for each East Bay city are available here. As such you must attend a class and visit the police department office to pay your reduced fine within that timeframe. If you can not make this deadline, then you will be required to pay the full ticket cost. 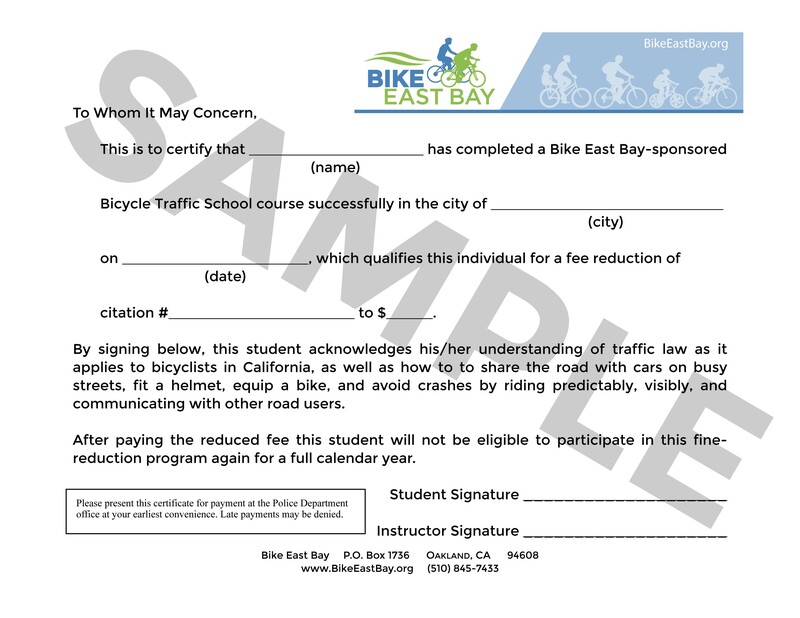 At the end of any Urban Cycling 101 classroom workshop provided by Bike East Bay, you should ask your instructor for a signed certificate of completion. You may then take that signed certificate to the police department office along with your citation to pay the reduced fine. Typically no. Unless otherwise noted on your citation, attendance at any Urban Cycling 101 class offered by Bike East Bay, in any city, qualifies you for a ticket fine reduction from any participating police department. No, this is an optional program. You may choose not to participate, in which case the ticket will be processed normally with the full fine applied. In most areas, the fines are the same regardless of whether the violation was committed while driving or bicycling, though base fines and court fees differ from city to city. That means up to $300 for a stop sign violation, for instance, or up to $500 for a red light violation. In every case, attending a Bicycle Traffic School class will lower the fine substantially. In California, driver license points are only supposed to be applied for moving violations committed by the driver of a motor vehicle, and not for bicycle violations. As such, Bicycle Traffic School only reduces the monetary fine associated with a ticket. If you believe that you were wrongly ticketed and did not break the law, you can go to the county court and ask for the ticket to be dismissed, and not participate in the Bicycle Traffic School program. However, if the judge denies your claim, you might not have the opportunity to take advantage of the program to have your fine reduced afterward. Contact your local police department, transportation agency, city council member, or other local elected officials to let them know about this opportunity. Anyone with questions can visit this page and contact Bike East Bay’s Education Director Robert Prinz for more info: robert@BikeEastBay.org or (510) 845-7433, ext 2. Bike education classes are a great way to encourage new bicyclists to ride more, and for experienced bicyclists to be safer by kicking bad habits. However, the most reckless individuals are also the least likely to attend a class of their own volition. Bicycle Traffic School programs enable bicyclists who are ticketed by the police to participate in a class as opposed to paying a full punitive fine, encouraging them to think more critically about their own behavior and avoid risks. If these classes are open and free to non-ticketed individuals as well, then it creates more bicycle education and encouragement opportunities for the general public. We recommend not charging attendees for classes. Keeping the classes free to participants means that ticketed bicyclists and the general public alike can take advantage of these opportunities, increasing their value to the community. This also means that you will have more class participants, even if the local police do not write any tickets to bicyclists. However, the police may still choose to collect a nominal, reduced fine from ticketed class participants to help pay for the program itself. Funding for Bicycle Traffic School classes could be provided by a local police for a flat per-class fee. This funding source is preferable as it would be continuous for as long as the police department is willing to participate, and could be nearly budget neutral for the police if the reduced fees collected from class participants helped to offset the class costs. Other grant funding sources might be acquired from a city government (such as annual Transportation Development Act funding), from a regional transportation agency, or from a local corporation or health care provider. Grant funding is usually only available on a limited time basis, however, which means that new funding would have to be acquired every few years or so to sustain the program. We recommend at least monthly, since ticketed individuals will need to attend a class and then visit the police department to pay their reduced fine before their ticket is sent off to the county court (usually within 30-60 days of issuance; check with your local police for their schedule). When a bicyclist is ticketed by a police officer in an area participating in the Bicycle Traffic School program, a sticker is applied to the back of the citation by the officer with program details, our website and phone number for more information (sticker template here). Ideally, verbal notification is provided by the officer at that time as well. The ticketed individual can find class dates/times/locations online or by phone, then attend a free, 2-hour classroom workshop within the timeframe indicated on the citation sticker. Our classes are called Urban Cycling 101, and are taught by instructors certified by the League of American Bicyclists with curriculum based off of the League’s Smart Cycling workshops. We offer several classes every month in different cities, so individuals will always have an opportunity to attend an upcoming class somewhere. We also make all of our classes free and open to the public so anyone can attend. At the end of the class the instructor will provide a signed certificate of completion (example here) which the individual can then take to the police department office at their earliest convenience to pay the reduced fee. We collect participant names and contact information at class via a sign-in sheet for verification purposes, if needed. Our classes are currently either paid for by a police directly via a flat per-class fee, by a city via a yearly grant allocation, or by a county transportation agency via a multi-year grant. No, the law only says that the program must be “sanctioned by local law enforcement”, so as long as your local police approve the material then it satisfies the requirement. Employees of the police department may even choose to teach these classes themselves. That said, using instructors certified by the League of American Bicyclists or another established organization, as well as presentation materials that are based off of existing bicycle education programs, will be more effective in encouraging safer and more confident bike riding, while also giving your program more credibility to potential funders. The League’s Smart Cycling classes or the National Safe Routes to Schools program are good places to start if you are interested in building a program from scratch. There also is no standard for how long Bicycle Traffic School classes should be. Bike East Bay’s Urban Cycling 101 classes were reduced over time from 4 down to 2 hours, both to make them easier for more participants to attend as well as to bring down the overall class cost. Post-class testing has shown to result in about the same level of information retention, despite the shorter class time, while class participation numbers have increased. Probably not. Typically traffic tickets are not revenue generators for local police, as most of the cost paid goes to the county court. Many police departments are already issuing tickets to bicyclists, usually for legitimate safety issues, so these programs will help to turn a purely monetary fine into a valuable educational opportunity. How can I encourage my local police to establish a Bicycle Traffic School program in my city? If you are based in Contra Costa or Alameda County, please ask your local police, transportation agency, city council member, or other elected official to contact Bike East Bay’s Education Director Robert Prinz for more info: robert@BikeEastBay.org or (510) 845-7433, ext 2. Bike East Bay currently provides over 150 free classes to 5,000 participants a year in multiple languages, and we have dozens of talented instructors eager to provide educational opportunities in more parts of the East Bay. Police officers involved in community relations, bicycle theft prevention, traffic safety, or other associated efforts may be good contacts to start with. If you have no receptive police contacts then taking your request to a city council or other elected official, a neighborhood crime prevention council, or to a city’s bicyclist/pedestrian advisory committee may be a good place to start. Put together a proposed budget for a year’s worth of monthly classes, including all related expenses, so you have a specific dollar figure to quote. If you still have questions that are not answered here please email Bike East Bay Education Director Robert Prinz for assistance: robert@BikeEastBay.org. Visit www.BikeEastBay.org/education to find out more about Bike East Bay’s free education program for adults, youth, and families with instruction provided in Spanish, Cantonese, and English.